The best way to get to know a community is by scheduling a tour. See the facilities, meet the staff and residents, and get a feel first hand what it's like to live at Covington Ladies Home Assisted Living. The independence that seniors desire with the peace of mind that comes from having personal care is the lifestyle we deliver at Covington Ladies Home. We exclusively serve the senior women in our community, and we never turn anyone away because of their financial situation. Our home is located in the historic Licking-Riverside District in a grand Victorian mansion. 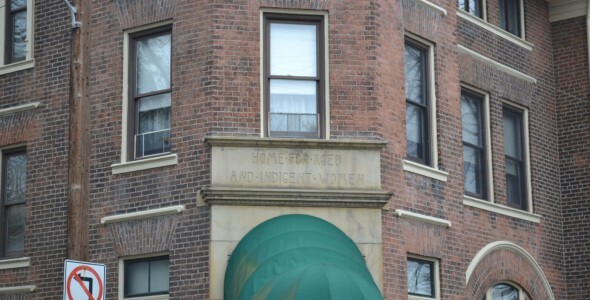 Since 1886 Covington Ladies Home has served the women of our community by providing them a place to live when they are unable to live independently in their own home. Over the years we have renovated our community many times so we can offer a modern, welcoming setting that has all the amenities and safety features that our residents deserve. Because our community only has 32 residents, we feel more like an extended family, where staff and residents know everyone's name. To fill our residents' day, we offer a full calendar of activities that have them laughing and recharging their spirit. Favorite activities include pet therapy, art class and crafter corner. When they aren't participating in an activity, residents can be found working outside in our garden, reading in the library or chatting in the TV lounge. For their new home our residents can select from a private studio which they can decorate with their personal furnishings. Included in the rent are utilities, including Wi-Fi. Weekly housekeeping and laundry services keeps the rooms tidy and frees residents from these daily household chores. Every day in our community dining room, our residents dine on delicious home-cooked meals. For holiday celebrations, the menu features all the traditional favorites. Friends and family are always welcome to join loved ones for a meal, and we can customize menu options for health reasons. We also offer scheduled transportation for errands and appointments, along with hairdressing services in our on-site beauty salon. To support our residents' independence, we provide assistance with activities of daily living and medication administration and monitoring. On each floor is a 24-hour nursing staff so help is always close at hand when it's needed. Discover the friendship and quality personal care that is found at Covington Ladies Home.